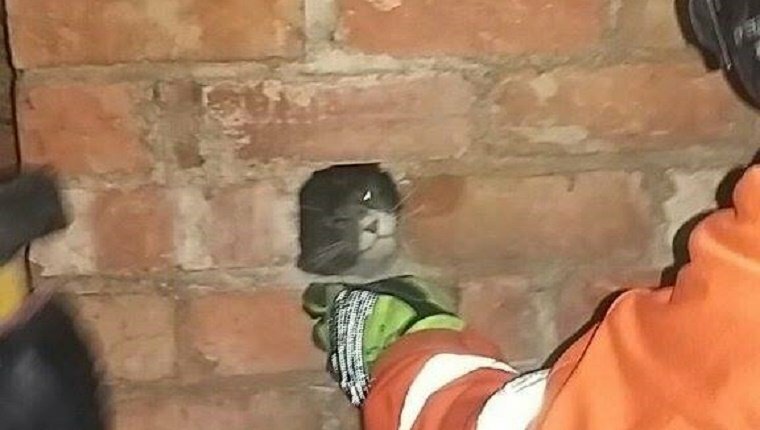 Firefighters weren’t able to tell by looking, but the telltale meows coming from behind the bricks of an old chimney let them know that Snitch the cat was trapped on the other side of the wall. It was that meowing that led Roger Gardner, the cats owner, to call the fire department, who arrived on the scene to help. Initially they tried to get Snitch out from the top of the chimney, but when that failed, they realized they were going to have to remove some of the bricks to get Snitch out. Sure enough, after they removed a brick from the chimney, they saw a very upset Snitch sticking his paw through the opening. With a little effort the scared kitty was removed. They believe Snitch may have fallen down into the chimney from the chimney pot. Hopefully the cat’s days of playing Santa Claus are over. Gardner is just happy to have his cat back, despite having a new hole in his chimney. Would you break your chimney to save your cat? What would you do if you heard meows coming from behind your wall? Let us know in the comments below!